Young people are particularly invisible/vulnerable in the event of a disaster. This evidence is seconded by scientific literature and previous research projects, which illustrate that young people from 14-18 years old are particularly ”hard to reach” and not usually addressed as a specific age group in disaster risk reduction activities and programmes. But it is also supported by some evidences arising from the Spanish case studies. Drawing on young people’s own experiences and demands, particularly from Lorca’s young people, who will be sharing their experience in the 2011 earthquake, we will collectively explore one of their main concerns: preparedness in public spaces. As we will see, in the event of a disaster they feel particularly fearful in public spaces, when they are usually alone (not accompanied by adults) and away from schools or at home (places they usually associate with emergency plans). Also, they feel they can be easily influenced by rumours and misinformation. Using the problem tree analysis, a participatory tool of mapping out problems, we will invite the public attending to the workshop to identify (in groups of 5 people maximum) the main causes and consequences of this situation. The value of this type of collective brainstorming and assessment with stakeholders, including young people, is to give the opportunity to acknowledge and establish a shared view of the problem, and to put forward ideas to tackle it. Throughout the debate, Spanish CUIDAR project will also introduce some ideas and dimensions that, according to our evidences, may contribute to make sense of, and potentially change, the situation. The workshop departed from the notion that young people are particularly invisible/vulnerable in the event of a disaster. This evidence is seconded by scientific literature and previous research projects, which illustrate that young people from 14-18 years old are particularly ‘hard to reach’ and not usually addressed as a specific age group in disaster risk reduction activities and programmes. But it is also supported by some evidence arising from the Spanish case studies. Drawing on young people’s own experiences and demands, particularly from Lorca’s young people, who shared experience of the 2011 earthquake, we explored one of their main concerns: preparedness in public spaces. In the event of a disaster they feel particularly fearful in public spaces, when they are usually alone (not accompanied by adults) and away from schools or at home (places they usually associate with emergency plans). Also, they feel they can be easily influenced by rumours and misinformation. 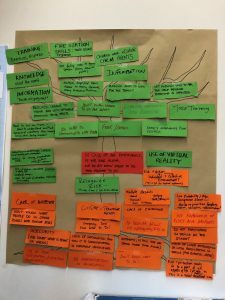 Using the ‘problem tree analysis’, a participatory tool of mapping out problems, we invited workshop participants to identify (in groups of 5 people maximum) the main causes and consequences of this situation. The value of this type of collective brainstorming and assessment with stakeholders, including young people, is to give the opportunity to acknowledge and establish a shared view of the problem and to put forward ideas to tackle it. 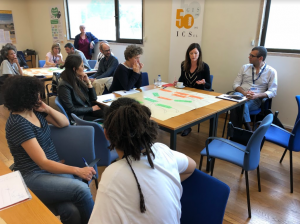 Throughout, the Spanish CUIDAR project introduced some ideas and dimensions that, according to our evidence, may contribute to making sense of, and potentially change, the situation. 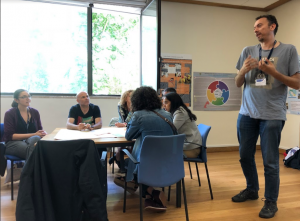 About 30 persons attended this workshop, organised by the CUIDAR Spanish team and four young people from Lorca, with one educator from the Youth Council as support. Participants had diverse backgrounds and came from different countries (Portugal, United States, Japan, Spain, the United Kingdom, etc.). – Welcome and presentation of the workshop organisers (UOC members and young people from Lorca). – Presentation of the workshop goals: sharing the results of the CUIDAR project in Spain with an engaging format. Lorca was the main example but with many similarities with the Gandesa and Sant Celoni groups. – Presentation of the ‘problem tree’ methodology. 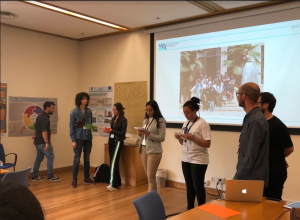 Lorca young people’s presentation: Two of them firstly presented themselves and the earthquake they experienced in 2011 and then shared the problem tree they had prepared for this workshop while composing the tree as a poster on the wall (and supported by a PPT presentation). We are young people from Lorca, Murcia, we are currently between 16 and 18 years old, we study in different institutes, and we belong to different associations and youth groups. In May of 2011, our city trembled for 5.2 seconds, 5.2 seconds that changed everything. About five o’clock in the afternoon there was a first tremor, the first warning, as we like to say. We all know or have learned in this project that a situation of this kind cannot be foreseen. At five past ten, we experienced the most eternal 5, 2 seconds of our lives. At that time, we were about eight and ten years old. Some of us were alone in the park, others taking care of our brothers at home and others doing out-of-school activities. As a result of the earthquake, and of our participation in the CUIDAR project, we have had the chance to deal with the problems, causes and consequences of the earthquake. We are now more aware that we live in a seismic zone where the Eurasian and African plates come together, creating friction and giving rise to the fault of Murcia. The problem chosen by the young people was situated in the trunk of the poster tree. Then, each of the causes of this problem they had detected was written in pieces of paper and pasted in the ‘roots’ of the tree. Finally, also written in small pieces of paper and pasted on the branches, they exposed the consequences of their problem. – In Gandesa: 12 year-old children also remarked they feared to be alone in case of emergency. They imagined themselves being in the street, playing, while facing a forest fire, and not knowing what to do. They considered they had not much information on how to face these situations, particularly on how to manage fear. – In Sant Celoni: 14-year-old teenagers also emphasized fear and uncertainty in the event of a chemical accident, the risk they chose to work with. In particular, they fear to be blocked and paralyzed if the event takes place when they are not at home or school. What to do if we are in the street or on our way back home? How to behave? How to control fear and uncertainty? – Emotions are central to children and young people, especially fear and how to manage it. – Children and especially young people may feel particularly vulnerable in public spaces. As they get older, they become more concerned about the lack of preparedness measures for public spaces: when they are ‘alone’, i.e. not accompanied by an adult, and away from home or school or places where they, or ‘someone’, usually knows what to do. – They point to preparedness blind spots, but they also challenge the way experts and professionals usually address this. As young people make clear, they don’t want to encourage an over-regulation of public spaces. On the contrary, they want to keep these as spaces of autonomy, independence and self-regulation. However, they told us they need more information about what to do in the event of an emergency, so they can actively contribute to making public spaces more resilient. What’s your opinion about these results: do they corroborate your own experience? Or do they significantly differ from it? Can we consider these gaps (adolescence, public spaces and emotional management) as a pending global issue for DRR strategies? Or is it just a local reality? Problem tree: Could you contribute with any input (causes and/or consequences) that helps us to broaden or reformulate our problem tree? Young people from Lorca and UOC team members distributed themselves among these working groups that lasted about 20 minutes, to engage with the discussion and ask and answer questions. Share the results with the whole group: During the last 15 minutes, a spokesperson from each small group shared a summary of their discussion and conclusions. Most of the groups corroborated the Spanish results, though adding specific comments based on their own experiences and locations. Then, all their written pieces of paper were collected and pasted onto the Lorca young people’s tree. Some of the causes added to the Lorca analysis were: lack of knowledge, awareness and communication; the complexity of multi-hazard situations with different self-protection measures; lack of regular drills; or the feeling that it is ‘hard to tell the truth’ to adolescents and to understand multiple behavioural reactions. Some of the consequences added were: not feeling safe in many spaces; multiple and amplified fears; or chaos. Moreover, some possible solutions emerged during the process: more training, information, knowledge and learning experiences; more drills; developing family and friends emergency plans; use of virtual reality tools; activities for recognising risks (study tour, leisure activities); young people’s empowerment actions and fostering a cultural change towards self-protection and understanding risks as embedded in daily life.